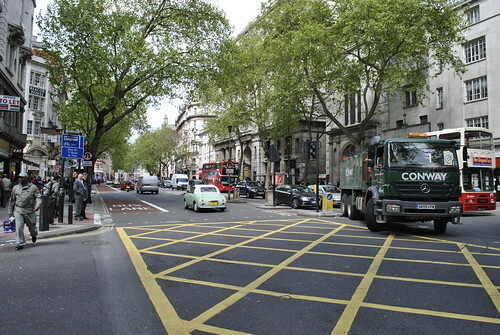 My last stop before returning to the US was London, for two days, Sunday, May 9 – Tuesday, 11th. I flew from Berlin to London Stansted and took a bus into the city. I arrived in central London around 2pm and spent Sunday afternoon exploring by foot. Similar to my experience in Rome and Paris, the actual scale of the city was not what I interpreted from a map. I was able to walk a good way across central London. My first major stop was at the Tate Modern Gallery after crossing the Millennium Bridge over the River Thames. To my surprise much of the gallery was free. Around 5:30, I met up with my friend Jackson who had been visiting London for much of the week already. We met at Westminster Abbey where we planned to attend an organ recital there. Unfortunately it was cancelled, so instead we walked around more, stopping along the river across from Parliament so Jackson could finish a sketch of it. We also walked past Downing Street nearby, amidst Britain’s prime minister debacle. We ate at a restaurant somewhere near Piccadilly Circus, a famous intersection in London now dominated by bright, colorful neon signs – the Times Square of London if you will. After dinner we walked around a bit more – past a number of notable buildings and sites Jackson pointed out to me as well as Buckingham Palace. Jackson flew home the following day so we parted ways and I returned to my hotel. I stayed at the City Hotel on the eastern edge of central London in the London Borough of Tower Hamlets, near the Aldgate East Underground station. It seemed to be a very diverse neighborhood. On Monday, my last full day, I did some more walking and for much of the day it was actually sunny and warm, which was fantastic. After stopping for lunch at a coffee shop down the street from my hotel I went to visit the London Transport Museum. This was a very cool museum about the history of transit and all modes of transportation in London. It was a bright, attractive museum, recently renovated, located in a Victorian iron and glass former market building. The museum covered just about everything related to the transport system from its development to marketing and of course its buses and trains. Several historic vehicles were on display as well as a few more modern buses. Covent Garden, the district around the museum was very active and attractive. The scale and design of buildings, streets, and public spaces were accommodating and visually pleasing. My next destination was Sir John Soane’s Museum, but unfortunately it was closed that day – as well as Sunday so I wouldn’t have been able to go at all anyway. Across from the museum – actually his former house – is a nice green park where many people were out enjoying the sunny weather. My exploration took my by St. Paul’s Cathedral, which is opposite of the Tate Modern, north of the Thames, connected with the Millennium Bridge. I was not inclined to pay the stiff fee to go inside, so moved along. I made my way to Hyde Park on the western side of central London. This was a romantic landscaped with axial pathways, formalized spaces, as well as sections of naturalized meadows. A major feature of the park is the Serpentine, a large water body that splits the park into two. A cafe building is located next to the water along with several other stands and boat rentals, etc. The lake and surrounding reminded me a lot of Lake Calhoun in Minneapolis. The park was active with people, squirrels and pigeons. Later in the day I took the Underground out to see Canery Wharf, an enormous urban office park in east London. The Underground was connected to multiple buildings through a series of underground corridors lined with shops and places to eat. I went back to my hotel neighborhood and ate at one of the countless fried chicken joints that lined Whitechapel Road. I walked down the road a number of blocks and stopped in an interesting public library branch. Tuesday morning I headed to Heathrow for my flight back to the States. My stop in London was short, but sweet. After over a week traveling through Germany and a whole semester in Rome, I was ready to go home. This concludes my post-semester travel posts, albeit a little late. The numerous places I had the good fortune to visit and experience in Europe will undoubtedly influence my perspective on urban issues closer to home. I am more aware of what I appreciate about American cities and society, and enlightened on what European urban qualities may actually be beneficial and applicable in the U.S.
See all my photos from London here. 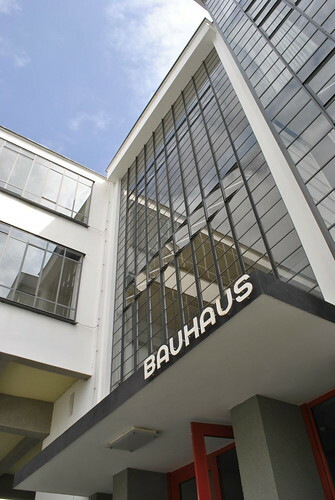 On Saturday, May 9, my last day in Germany, I traveled from Berlin to Dessau to see the Bauhaus. I did not preplanned this side trip, but had one day left on my DB rail pass and felt I had seen enough of Berlin. 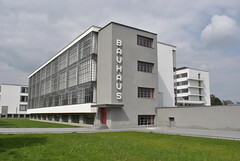 The Bauhaus is located in a quiet, mostly residential area a few blocks west of the train station. 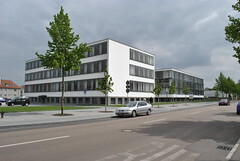 The more commercial city center of Dessau is located to the east of the station. The approach to the Bauhaus is along Bauhaustraße lined with several sleek, contemporary buildings, for which I found an interesting description from another visitor here. I assume the placement of these buildings were intentional, a preparation of sorts for reaching the Bauhaus itself, while presenting an intriguing first impression of the town. The Bauhaus itself was of course neat to see and explore its many areas. 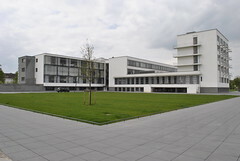 There were several other Bauhaus buildings in Dessau – a few blocks north were the Masters Houses, built around 1930, to provide dwellings for Walter Gropius and other Bauhaus masters/teachers, including painter Wassily Kandinsky. The Gropius House was singular while the other six were paired into duplexes. The Gropius House and one of the dwellings in the house adjacent were destroyed in air raids in 1945. A more traditional home was built over the remaining Gropius foundation, while the other dwelling was never rebuilt. Those remaining have undergone renovations to restore the houses to their original condition. For a small entrance fee, it was fun looking through the different houses. I continued my walk further northward, along the edge of town to see the Bahaus-style Kornhaus Restaurant on the banks of the Elbe River. The walk back toward the center of town was through a less dense, mostly residential neighborhood. 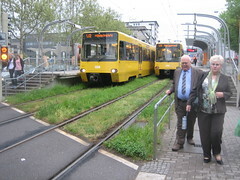 Before leaving Dessau I took a ride on the minimal tram system. I was surprised to find rail transit in such a small city – even in Germany, but the service headways were quite long (at least for Saturday afternoon). On my ride I saw much of the more commercial area of Dessau east of the train station. Further out it seemed to get more sparse and less attractive. Afterwards I stopped in the Rathaus Center – a shopping mall in the heart of the modernized city center – to grab a few pretzels for a snack. The mall was quite busy with people compared to relatively light foot traffic outside. I’m not sure what to make of the “newer” part of Dessau, but the seeing the Bauhaus was definitely a good way to spend my last day in Germany. On the way to and from Dessau I had to switch trains in Lutherstadt Wittenberg, the town where Martin Luther nailed his 95 theses on the door of the Catholic church in 1517. The station was not near the Marktplatz so did not see the church, but did venture through a few blocks of a different area in the time I had to wait. On the way back to Berlin, I accidentally got off one station too soon, which was actually closer to the old center of town. At first I was a bit concerned, but ended up having plenty of time as my connecting train was running late. Simply by chance, a bicycle race was passing by right as I exited the train. A camera car followed the swarm of cyclists so it was evidently something significant enough to be on TV. To get back to the next station I took a nice walking path that followed the tracks most of the way. Small cottages with plentiful gardens lined the path so it was a nice walk. The small, unintended visits to small towns were some of my most memorable. See all my photos of Dessau and the Bauhaus here. I stayed in Berlin from Thursday, May 6 through Sunday the 9th, during my travels through Germany. Berlin was quite a different beast than Munich – much larger, spread out, and modern. The six hour trip on the Intercity Express was relaxing, but when I arrived it was pouring down rain, which made for a less than welcoming arrival. 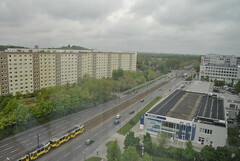 I stayed at a large corporate hotel a good distance from the center, among the super blocks of eastern Berlin. I took the S-Bahn from the new, multi-level Hauptbahnhof and switched to a tram at Alexanderplatz. From the tram I had to walk in the rain – which I ended up walking up the wrong street at first so was not too pleased. The area was characterized by wide, multi-lane thoroughfares with enormous blocks bearing large, ubiquitous apartment buildings. (photo below left) The scale was oppressive, unlike anything I’ve seen before. Once I got to my hotel room – which was the most familiar (American) type of room I had stayed in, yet the least comfortable (too large for one person) – I retreated to a nap for a few hours as the rain tired itself out. Later that evening I took the tram back to Alexanderplatz (photo above right) to eat and look around. 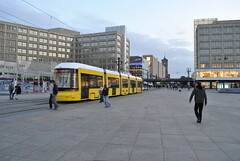 Alexanderplatz is a large, open public square surrounded by large retail centers and a major local rail and transit station. It has a very open (almost too open) feel so is certainly not the intimate public square you’d find in Munich or other towns. Very close by is the distinctive Rathaus (City Hall) and Fernsehturm TV tower. On the square there is a large, five-story Kaufhof department store, rebuilt in 2004, at the same time as a major underground rail project. More buildings have been constructed or redeveloped since, with more to coming. On Friday I returned to Alexanderplatz to explore more of Berlin’s mitte (city center). The sky was still gloomy, but at least no rain. I spent sometime looking at an outdoor exhibit about the GDR and Alexanderplatz demonstration, until some punk “from Poland” started heckling me for money and wasn’t too happy when I wouldn’t give him any. 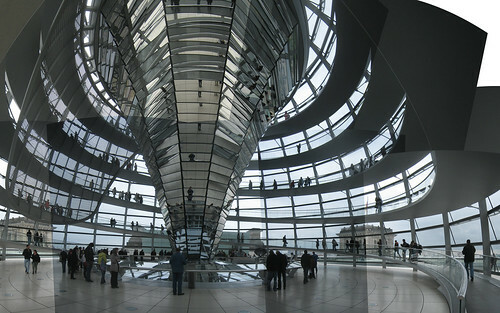 I then took a bus west a little bit to the Reichstag Building, home of the Bundestag, Germany’s parliament. I waited about an hour to go inside and see the signature dome (large photo at top). It was interesting and provided great views of central Berlin. I continued walking, past the Brandenburg Gate, which was actually not that large, and then to the recently-built Memorial to the Murdered Jews of Europe, a large block composed of concrete slabs varying in height, forming a series of gridded pathways undulating along the terrain. It is intended to create a sense of disorientation and confusing, while representing “a supposedly ordered system that has lost touch with human reason.” (Wikipedia) The memorial is very interesting architecturally and symbolically, but is not without criticism regarding its merit (as a memorial or more for tourism), a construction company with distant Nazi ties, and evidently no where inside or around the memorial does it say what it commemorates. From my own observation – the behavior of visitors seemed a bit disrespectful with kids running around and people casually relaxing on the lower slabs. 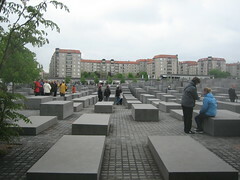 Like I said, interesting space, but not sure if it is the best use of such a large space in the middle of an urban center struggling for connectivity and human scale, nor the best way to remember the millions of Holocaust victims. I then walked to Postdamer Platz, another significant public “square” in Berlin. It was a circular space enclosed by modern glass towers, somewhat disconnected from the surrounding streets. I believe there was a movie theater in there, as well as a number of restaurants, but mostly office space. It wasn’t too active when I was there. Next I came upon the Topography of Terror, the former site of the Gestapo and SS headquarters, now an outdoor museum containing a remaining section of the Berlin Wall. A new contemporary building houses an exhibit that’s very informative. 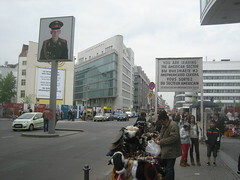 I continued a few blocks away to the infamous Checkpoint Charlie. The setting, again, was not really what I expected – I came to it quite suddenly. 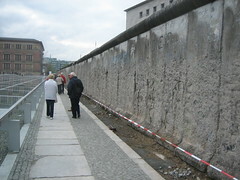 The area was very touristy, which seems unfortunate for such an important place in Berlin and Germany’s history. I walked back north a little way to the mitte, which appeared on a map to be more of nice “downtown” area with a cohesive grid of streets. Despite being west of the river (which I originally assumed was the “center” of the city and therefor generally the divide of former East and West Berlin), the mitte is all still in the former East Berlin. The blocks were a bit large – nothing like the block sizes out by my hotel though – and not very attractive or active. With mostly large, boxy office buildings and wide streets it reminded me of parts of downtown Washington DC. I did come upon Gendarmenmarkt, a large square dating back to the 17th century, defined by the historic Konzerthaus, flanked by German and French cathedrals. There was a guy sitting by the modest central fountain playing a horn to a familiar tune. The sun also began to peak out from the clouds, which it had been hiding behind since I arrived in Germany. Feeling I had sufficiently seen the mitte, I took bus route 100 to the “downtown” of former West Berlin (photo left), dubbed “City of West” on my complimentary hotel city map. In between the east and western downtowns is an enormous Tiergarten (zoo). I had been a bit discouraged by the condition of Berlin so far, so was curious how different it’d be in the west. It was definitely more active than many areas I saw in the east, and seemed more cohesive with fewer gaps and gouges in the urban fabric. It was generally nice, but seemed pretty new and lacked uniqueness. I explored a few blocks before taking the U-Bahn (urban subway) a few stops, and then switched to the S-Bahn (suburban rail) to check out the nearby city of Potsdam. When I arrived I couldn’t tell which direction the city (center) was from the station. It was beginning to get dark and the station did not seem to be right in the middle. 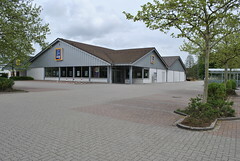 There was a lower-quality shopping mall within the station, including Kaufland – a Walmart-like discount store, presumably affiliated with Kaufhof. I stopped in to get a cheap duffel bag to alleviate my single overpacked and overweight suitcase for my remaining flights. On Saturday, my last full day in Germany, I ventured from Berlin to Dessau, home of the Bauhaus. Of course there was much more I could’ve seen in Berlin, but one more day wasn’t going to make a large dent and I had one more day on my rail pass to use. Only deciding on this excursion the night before, another consideration of was Hamburg, which I decided against since it was further away and another very large city that would be difficult to take all in in one day anyway. Berlin was a very interesting city to see, especially in contrast to Munich and the more romantic towns of southern Germany. Berlin has yet to fully recover from its not very distant woeful past. 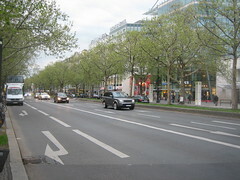 Redevelopment of significant places like Alexanderplatz and Postdamerplatz lack wholeness and good connectivity. 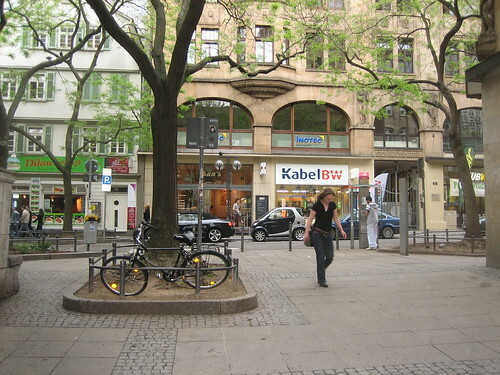 Much of mitte “East Berlin” remains full of spatial gaps and large, mostly homogenous-use buildings and large blocks leave sidewalks barren of activity. The Berlin Wall and associated history dominate tourism, casting an inevitable shadow over the city that will prevent it from ever healing completely – at least from a tourist or visitor’s perspective. Most of all my disappointment in Berlin was the poor urban form and scale I experienced that leaves many places feeling uncomfortable, anonymous and incomplete. See all photos from Berlin here. On Tuesday, May 4, the fourth day of my travels, I took a train from Munich to Garmisch-Partenkirchen in southern Bavaria to connect with the Zugspitzbahn to ascend the highest mountain peak in Germany. The Zugspitzbahn is a cogwheel railway to climb the steep slope of the Zugspitze mountain. The station is adjacent to the Garmisch-Partenkirchen Bahnhof. The scenery was memorable on the way up, passing mountain homes, high pastures, and dramatic mountainsides. The train itself was modern, bright and comfortable. The ride up takes about an hour, with the last portion through a tunnel, terminating at Zugspitzplatt, still 350m from the peak. From there a suspended cable car takes visitors the rest of the way to the top. I stopped at Zugspitzplatt to take in the view from there – which was the best view I had. It was very cloudy, but I could see some nearby peaks. It was spectacular – everything very bright and white with snow and fog. A minor hike up a hill from the rail/cable car station sits Maria Heimsuchung Church, the highest church in Germany. I continued to the top, which took a bit of waiting as the cable car did not run very frequently. As we ascended fog quickly consumed everything in sight with nothing but bright whiteness until we reached the top. I immediately went to the top to the observation level and was the first one out there. It was incredible and bizarre. Visibility now was maybe 50-100 feet, so there was no view but whiteness. It was erie to look over the edge and see nothing. The unchanging bright whiteness began messing with my eyes. The temperature was probably below freezing – icicles and frost hanging off railings. Half of the peak is actually in Austria, however the section was closed off. I knew the border was very near but did not realize it split the peak. So I never went to Austria, but I was very, very close. Nothing at the peak was really open (gift shop, etc.) so I took the cable car back down soon, and then had to wait a while for the next train. After returning to town I spent an hour or so exploring on foot before the next train to Munich departed. Understandably, it reminded me of resort towns in the mountains of Colorado, but more legitimate. There were businesses, community and infrastructure not dominated by tourism alone. A characteristic of Garmisch-Partenkirchen were the numerous buildings decorated in ornate exterior frescos. Near the train station is the stadium from the 1936 Winter Olympic Games. Hitler had forced the two individual towns of Garmisch and Partenkirchen to merge in anticipation for the games. They remain unified today. 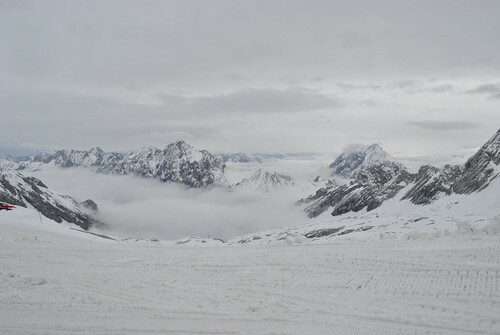 See all my photos from the Zugspitze and G-P here. During my post-semester travels to Germany, I stayed in Munich from Sunday, May 2, through Thursday the 6th, when I went on to Berlin. Despite cloudy and sometimes rainy weather it was enjoyable. The capital city of Bavaria was much more modern than I had been excepting and its “historic” center is actually quite small. I realized quickly I was not as familiar as I thought I was. Like in Stuttgart the Hauptbahnhof was located just on the edge of the center, but was of course much larger. It was rebuilt in the late 1950s after sustaining severe damage in WWII as the rest of the city did, so its exterior appearance is not very pronounced, nor particularly attractive. The train shed is not the grand space of Frankfurt’s main station, but elegant in its own means. My friend who was also doing some post-semester travel happened to be in Munich on Sunday and Monday so I met up with him and hung out with a number of people staying at his hostel. Monday morning we went on a three hour “free tour” (paid by tips) of central Munich. It actually didn’t cover much area but was extremely informative and gave everyone a really good insight into Munich’s history and culture. It turns out nearly all of the historic center of Munich was ruined beyond repair in the war, but it was completely rebuilt to appear the same as before. This was both hugely disappointing and intriguing at the same time. The central public space in Munich is Marienplatz, which draws crowds daily at 11am for the Rathaus Glockenspiel. Just around a corner is a big market space with a number of different vendors (photo at top) as well as a large beer garden. Following the tour we ended up going to a beer hall with our guide and several others on the tour. Later on we went to Hofbrauhaus with two guys from the UK that we had met on the tour. For dinner we went to Augustiner beer hall just north of the Hauptbahnhof. This was where I had my first real German meal – wiener schnitzel. It wasn’t exactly the most productive day, but it was cold and gloomy out again, and was interesting getting to know a few other world travelers. On Tuesday, I spent all of the day going to the Zugspitze, the tallest mountain peak in Germany, which I’ll talk about in the next post. Wednesday, my last full day in Munich, I visited the Deutsches Museum Verkehrszentrum (transportation museum) in the morning and the main Deutsches Museum in the afternoon with more exploring on foot in between. I, of course, enjoyed the transportation museum, which had a number of historic and contemporary German rail and transit vehicles on display, as well as several cars, bikes, etc. The Deutsches Museum, the largest museum of science and technology in the world, is located on an island in the river to the east of the historic middle. It was indeed large – I went through pretty quickly in maybe two hours, hoping to see more of the city before it got dark or started to rain. After the museum I took the U-Bahn (urban subway) out to see the 1972 Olympics stadium complex. Neat to see, but it was quite a walk and it had began misting. That evening I strolled around the city center for my last night in Munich. 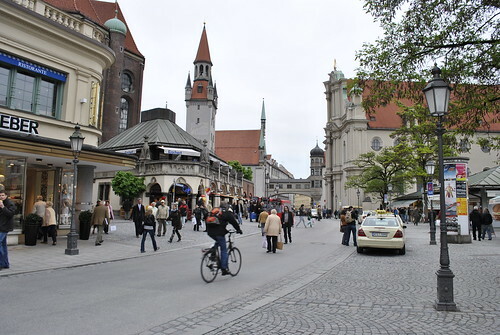 Munich was an interesting city to visit – a modern and influential city with pleasing urban scale, terrific transit, and a rich cultural identity. See all my photos from Munich here. I stopped in Karlsruhe, a city of about 300,000, for about two hours while traveling between Kandel and Munich on Sunday, May 2. 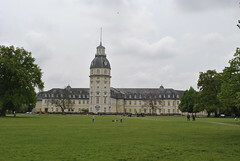 About 20 km southeast of Kandel, the city originates at Karlsruhe Palace, which was built in 1715, with the city developing around it. I walked from the Hauptbahnhof on the south edge of the city center, north to the palace and gardens bounding the northern edge. 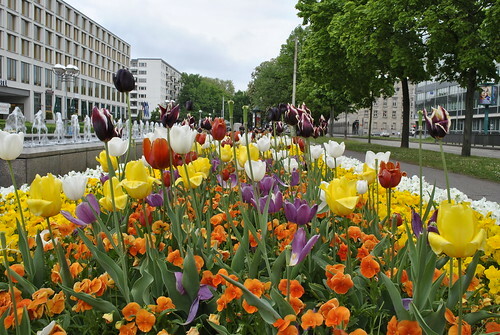 Right across the street from the train station is the Zoo and Stadtgarten (city garden). I walked along the zoo edge until I reached a pedestrian bridge Tiergartenweg (“Animal Garden Way”) that spanned the width of the park, lending a delightful view of blooming tulip beds, a meandering water channel, and even a glimpse of a few animals. I continued my walk past a large building complex with extensive flowerbeds of tulips and other varieties. The Karlsruhe Palace grounds were nice to see with several people enjoying the day in the large green behind it. There was a pond and a miniature railroad. Next to the palace grounds sits the Federal Constitutional Court of Germany – I recognized the contemporary building. From what I saw, Karlsruhe is a nicely scaled city with a nice variety of new of old buildings. 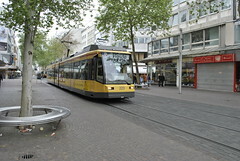 It is very pedestrian and transit appeared to be extensive for the city’s size, however I was only in the city center dominated by businesses and public buildings. 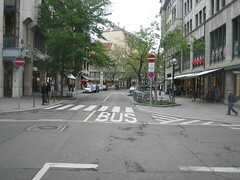 The scale and aesthetic was similar to Stuttgart, but secondary and noticeably smaller. It was nice to see a smaller German city with a population similar to Cedar Rapids-Iowa City. See all photos of Karlsruhe here. On day two of my journey in Germany, the first of May, I took a train from Stuttgart to Kandel (see on map), via Karlsruhe to visit the small town I have ancestry tracked back to the 18th century. Thanks to research by my Great Uncle Edgar who put together an extensive family tree book a few years ago, I knew my Great Great Great Great Grandpa George Lindemann was born in Kandel in 1780. The Lindemann family is actually the ancestry of my mom’s father’s mother, but it’s the most in depth family history I’m aware of and technically just as much a part of me as my paternal lineage. Explained visually below. 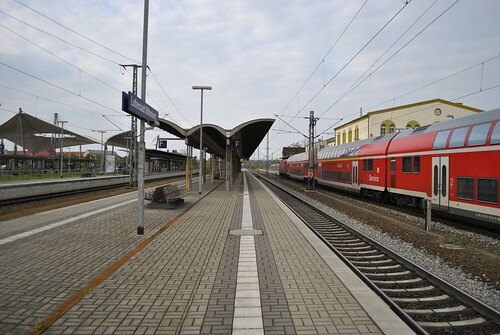 I arrived at Kandel Bahnhof, a minimal two track station, around 11:30am and walked a few blocks north to the center of town where my hotel was. My first impression was nice; it was small and quaint, just what I had expected. 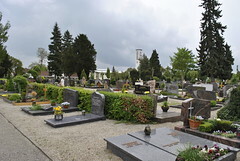 Since it was near my hotel, I first went to the one large cemetery in town, located on near the northern edge next to the contemporay (mid 20th century) Catholic church, though not directly affiliated. The cemetery (photo below left) was compact but dignified. Unlike the typical small town cemetery in America, it was not grassy; rather a grid of paths and individual plot landscapes. However it was more familiar with similar gravestones and modest markers than the cemetery I explored in Rome. I browsed around for a little while, looking for any Lindemanns to see if I could find anyone new. I didn’t spot any and the cemetery was not that old, most burials within the last hundred years and only two or three plots with birhts in the late 1700s. This was a bit disappointing – I even went back later in the day and checked every row, no Lindemanns and no other cemeteries in Kandel. After skimming the north edge of town I walked to St. Georgskirche (St. George’s Church), the landmark church in Kandel, parts of which date back to 1468. 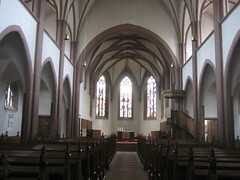 The largest Gothic church in the region, it has been largely rebuilt more than one time. 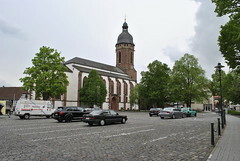 For about a hundred years the church was home to both the Protestant and Catholic congregations until 1957, when a new Catholic church was built in Kandel and St. George’s reverted back to purely Protest. I was hoping there would be an older cemetery of some sort by the church. 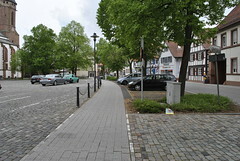 Instead it was surrounded by a small parking lot – but a very attractive one, neatly paved in cobblestone that could very well function as a public plaza. I continued on walked a few blocks of Hauptstraße, the main street running through town lined with real timber frame homes and businesses stretching from city end to end. I noticed there was very little activity today – I would walked blocks without seeing anyone. I later realized it was May 1 – May Day, which evidently is a national holiday in Germany. A bustling main street scene would’ve been nice – or at least open businesses – but oh well. I made my way to the southeast corn of town and than down south along Lauterburger Straße, what I’ll call the “South Duff of Kandel” (Ames reference) because it was lined on the east side with the town’s “big box” stores and businesses. These included an Aldi, a Netto discount market, a small car dealership – not exactly Target, Walmart, and Best Buy, but they’ll do. I made my way back west as I was making a huge clockwise loop around the town. I came upon a nice community park with a decorative pond and playground that were under renovation. Adjacent was a soccer field and two school buildings – one that I assumed to be the equivalent of a high school had a very neat new addition. The southwest corner bordered a large nature park forest dissected by several linear paths. 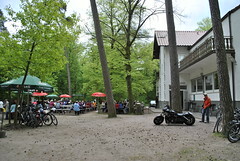 I decided to walk down one for about 2 km, where I came upon a restaurant building and small beer garden in the middle of the forest (photo above right). There was a big crowd today – the most people I had seen all day. I then headed back northward along a road, eventually making it back to Hauptstraße at its very western extent of being built up around. Walking along Haupstraße from the western edge all the way to the east end took a while, but allowed me to see pretty much every corner and end of Kandel. The entire stretch is characterized by small one to two-story, traditional timber-frame structures. Except for the middle that is dominated by businesses, they are pretty much all single family houses. The northeastern corner of town is newer with lower profile homes and a few small, bland apartment houses. Heading back toward the hotel I passed the Kandel hospital and culture center. It was really unfortunate I visited when everything was closed and no one was around. Considering my success at the cemetery, I was unable to find any other Lindemann traces, so the visit was a lot less personal thank I had expected, inevitably just a random small town I chose to see. I had a hard time finding any German food for dinner that night. Every restaurant I came upon that was open was, believe it or not, Italian! There were a few fast food kabab/pizza place on the main street, but I eventually found “Candle’s Lounge” in a small beer garden complex. It was awkward and boring eating alone, but it was dinner. Due to the gloomy weather and lack of pretty much any livelihood I initially felt a bit disappointed in my Kandel visit, but appreciate the experience as I look back. Sunday morning I was considering attending church at St. Georg’s even though it’d be in German. I ended up sleeping in instead, which I now really kind of regret. It would have been neat to experience – and finally see some people! I did end up going by on my way to the train station around 11am, thinking I could at least see the inside after the service (which began at 10). I got there just in time – when I went inside a few people were picking up and readying to leave. I’m curious if they would’ve had any records or displays that I could’ve learned more about the history and potentially my ancestors, but I wasn’t able to look around as they were closing. I’m glad I did get to see inside though; it was a good last impression of Kandel. 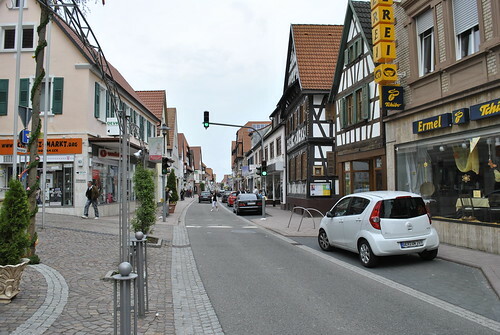 Aside from my own experience of literally just walking around all day long, Kandel was a really interesting visit to see a German small town and how they differ immensely from similar sized cities in the U.S. Although it appeared like a dead town when I was there, it actually seemed like an incredibly vibrant city. [I’m surmising] by resisting the over reign of chain restaurants, stores, and other businesses, a lot more of the economy is maintained locally, in addition to a remarkable national rail transportation system, small towns can stay viable and flourish. The quality and maintenance of public infrastructure is also very impressive. Kandel had a large stock of historic German timber frame buildings, which was also delightful to see. See all my photos from Kandel here. 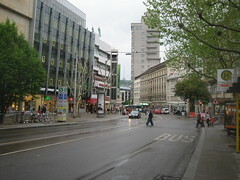 Stuttgart is Germany’s sixth largest city and the capital of Baden-Württemberg in southern Germany. Besides a short stop in Frankfurt to change from a bus to a train, Stuttgart was the first place I visited in Germany and it left a pretty good first impression. I arrived there afternoon on Friday, April 30, after a day of travel via plane, bus, and train from my spring semester home in Rome. My entry was through Stuttgart’s Hauptbahnhof (main train station), located of course near the old city center and next to expansive Schloßgarten, a 600 year old palace garden now containing several cultural facilities like the State Theatre and Art Gallery. 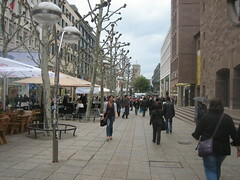 The garden is bordered on the west side by Königstraße, the” main street” of Stuttgart that is a bustling pedestrian zone dominated by retail. Central Stuttgart has a wonderful sense of place with mostly calm, pedestrian-scaled streets and a wealth of public spaces. Despite some light rain, it was pretty active this late Friday afternoon, especially on Königstraße. The city center is a good size and nice mix of old and new. 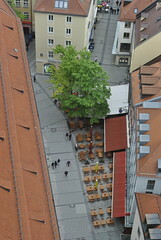 Marktplatz is a large, but intimate space tucked away in the old streets of the inner city, surrounded by mostly contemporary buildings (it was damaged heavily during WWII) including the rebuilt and recently renovated Rathaus (city hall). The general public is able to go freely inside the Rathaus where there were exhibits on city redevelopment proposals and a small art gallery on the ground floor. 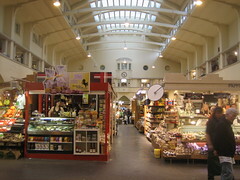 A block away from Marktplatz is the Markthalle, a large enclosed market building. Originally completed in 1914, it was heavily damaged in WWII and rebuilt in 1953. It is very bright and clean inside with around 50 stalls. I mostly just walked around that evening (and checked out the Straßenbahn), but also enjoyed some live music. 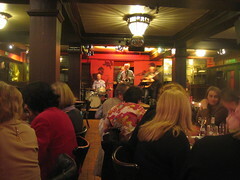 After having supper at a small, casual burger place I went back to a basement jazz club I had passed earlier. The “Oldtime Jazz Quintett” was playing that night at the Traditonal Jazz Hall. The place was not very busy with mostly groups of older couples (they also served German fare so I regretted not just going here for dinner). Instead I just had a German beer with my jazz. The group played several numbers I recognized including one of my favorites, “Take Five” by Dave Brubeck. It was a fun evening and good start to trip. This was the extent of my visit to Stuttgart, but I was really impressed with what I saw. The city scale is appealing with a distinctive city center that despite modernization and reconstruction after WWII maintains its charm and sense of significance. Compared to my aesthetic perception of American cities of similar [population] sizes, Stuttgart really didn’t feel like such a large city because it lacked many of the negative aspects we usually associate with big cities in the United States – like traffic, ailing inner city neighborhoods, tall skyscrapers, and (in most cases) a physical and psychological disconnect between the urban core and surrounding areas. By maintaining its compact, human-scaled inner city (like most European cities) Stuttgart manages to accommodate the same kind of commerce, business, and industry without compromising good urban form and spaces that promote vibrancy, accessibility, and actual sense of community. The qualities of Stuttgart are things American cities aspire for, but (for most) are limited by existing urban form, political and individual will and of course the history that determined the structure and direction of urban growth and (re)development. See all my photos from Stuttgart here. Next posts about Kandel, Munich, Berlin and more coming soon. My semester in Rome concluded on April 30. Before returning to the States I spent a little over a week in Germany and two days in London. I had a Deutsche Bahn six day rail pass so traveled to several places in Germany including Frankfurt, Stuttgart, Kandel, Karlsruhe, Munich, Garmisch-Partenkirchen (Zugspitze mountain peak), Berlin, and Dessau (Bauhaus). It was a lot to take in, but my week was fairly relaxed and most of my time was spent simply walking around and exploring different places. It was very interesting to see the contrast between cities and towns in Germany compared to Italy, and of course the U.S. Most places I saw in Germany were extraordinarily clean, orderly and organized. Given my family’s mostly German heritage I really enjoyed visiting Germany and felt pretty comfortable with the little bit of German I retain from high school and was able to fit in pretty well. To present my travel experience most effectively I’ll break up my posts by city, rather than a strict chronology or conventional “travel blog.” That said, I list below a brief summary of my journey schedule, mostly for my own documentation. See all my photos from Germany and London on Flickr. We had a four day weekend in Rome for Easter, so a friend and I decided to take a short trip to Siena Friday through Saturday (April 2-3). Siena is a small city in the Tuscany region, about 250 km north of Rome. It was a very relaxing trip and the weather cooperated nicely. We spent a lot of time sitting in Piazza del Campo, the major square in the old town and famous for the twice-annual horse race held there. 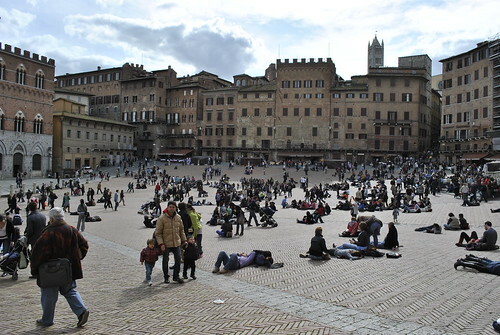 The irregular semicircular piazza (photo below) slopes down to one point so people gather there and sit and lay down, unlike most piazzas that are flat and have few places to sit. There were hundreds of people there during the day enjoying the sun, but at night activity is mostly limited to the perimeter restaurants, bars and cafes. On the piazza is the Palazzo Publico, originally a town hall built in around 1300, with the Torre del Mangia campanile. We went up the tower for great views of Siena and the Tuscan countryside in all directions. The Palazzo is now a museum, which we went through too. Most interesting was a temporary exhibit on Bauhaus architecture which included several drawings by Walter Gropius and other Bauhaus and modernist architects, plus a number of architectural models of their works. We stayed at a campground located outside the old city, which rented small trailer cabins. It was actually quite new and nice – and inexpensive. It was a pretty nice campground with its own restaurant and bar. Two bus routes ran between the city and the campground, but on Saturday we decided to walk back into the city instead. We happened upon Basilica dell’Osservanza, a modest brick church and monastery standing alone in the countryside. Originally built around 1490, it was rebuilt after being almost entirely destroyed in World War II. The exterior brickwork was attractive on its own, with the cupola (roof tip of bell tower) entirely in brick as well. Inside was small and minimal, and still regularly in use. It was refreshing to see. A few other churches we saw in Siena also had more modest interiors. Architecturally almost all of Siena’s old buildings have brick facades, instead of stucco like in Rome. This was much more attractive, without crumbling, dirty stucco covering the real walls. In more contemporary areas surrounding the old city, the buildings are pretty similar to those in Rome and other cities in Italy. Overall Siena is a very attractive, pleasant city. 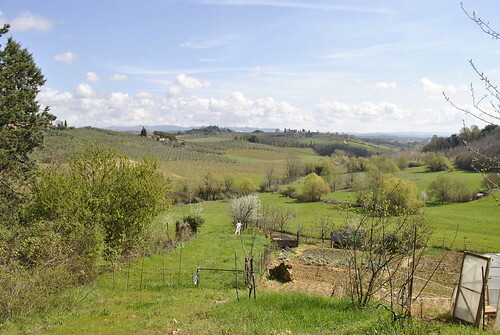 The surrounding Tuscany landscape was the most beautiful scenery I have seen so far in Italy (though the weather and time of season probably had something to do with it). I really enjoyed walking through the countryside and getting to explore the small, charming city as well. It was a great short break from school and Rome. See all photos here.